Strider II, also known as Journey from Darkness, and Strider Returns in the U.S.A, is a platformer developed by Tiertex and published by U.S Gold. It was released for various home computer formats in 1990 and later ported to the Mega Drive and Master System in 1992. Capcom gave the license to produce a sequel for Strider to U.S Gold and Tiertex due to the success of their home computer ports of the original game. 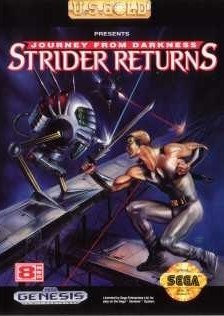 Although the original computer versions of Strider II got mixed to positive reviews. with time the reviews became a lot more negative. Capcom later made their own sequel for the arcade and the PlayStation in 1999 titled Strider 2, ignoring this game and rendering it non-canon. Clunky controls - yes, the original has this problem also but the levels were designed in such a way that they didn't ruin the game. Fortunately, this game is non-canon, as Capcom made the TRUE Strider 2 that's vastly superior than this game. This page was last edited on 16 March 2019, at 21:56.